A cookie that can help boost your milk supply? Plus a yummy treat your whole family will enjoy? YES, please! Do Lactation Cookies Really Help? What is all the rage with lactation cookies, and can they really help boost your milk supply? Including natural galactogogues (a substance that can support lactation) from food sources in your diet while breastfeeding can help maintain or increase your milk supply. These ingredients are nutrient-dense and offer a boost of B-vitamins, iron and other minerals, healthy fats, and probiotics that are helpful for postpartum and breastfeeding mamas. The combination of these ingredients in a cookie makes it an easy, practical (and tasty) snack for a busy, breastfeeding mama. Add a glass of your favorite milk (regular, almond, soy, etc), and you have yourself a balanced snack - perfect for optimizing nutrition and meeting your increased energy needs while nursing your little one throughout the day. Can Anyone in the Family Eat Lactation Cookies? The good news is that your whole family can enjoy this delicious cookie recipe. You don’t have to be a breastfeeding mama to eat lactation cookies. And contrary to the popular belief, eating lactation cookies won’t somehow make you start producing milk if you aren’t breastfeeding. That means you can whip up a batch of these not only for yourself but for the rest of your family, including older kiddos and daddy, too! If you are not making these for the purpose of supporting breastfeeding, you can always omit the brewer's yeast. If you or your little one can’t tolerate dairy, you can omit the chocolate chips or substitute with dairy-free chocolate chips. Using coconut oil instead of butter also makes these lactation cookies a dairy-free option that is safe to eat while breastfeeding your baby. These simple lactation cookies are nutrient-dense and offer a boost of B-vitamins, iron and other minerals, healthy fats, and probiotics that are helpful for postpartum and breastfeeding mamas. Ground Hemp Seeds, Raisins, Dried Cranberries, Chopped Walnuts, Sliced Almonds, etc. In a large bowl, use a hand mixer to combine coconut oil and brown sugar - mix until fully combined. Add vanilla extract and eggs, mix well. In a separate bowl, combine rolled oats, flour, ground flaxseed, brewers yeast, baking soda, and sea salt. Gently stir to combine. Slowly add dry ingredients to wet ingredients while mixing on low. Use mixer to incorporate all ingredients until well combined. Add chocolate chips and fold into the mix gently. Scoop dough onto lined cookie sheets and bake for 12-15 minutes, or until cookies are turning golden brown. Allow to cool before you enjoy eating! These cookies can stay fresh in an airtight container for up to 1 week, or you can keep extras in your freezer! If you are a pregnant mama, these would be great to make as part of your postpartum freezer stash of mealsbefore your baby comes! While the addition of natural galactogogues in your diet can help support breastfeeding, keep in mind that these cannot fix an underlying issue that may be causing fluctuations in breast milk, like poor latching or overall lack in maternal nutrition. If you are concerned about a sudden dip in your milk supply, be sure to connect with a Lactation Consultant to help address any underlying causes. 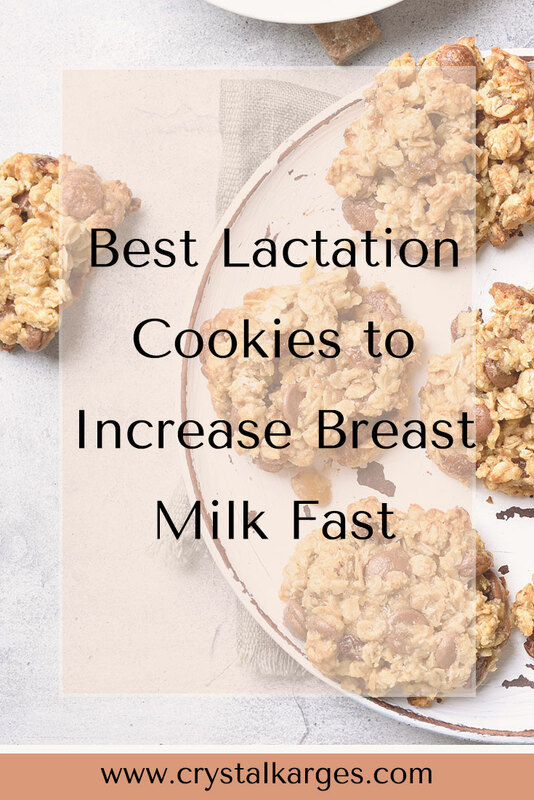 There are many ways to increase breast milk naturally and maintain your milk supply (along with your favorite lactation cookies!). Thank you! Your meal plan will arrive to your inbox shortly. Need more support? Learn more about nutrition coaching for moms!